News and pop quizzes from your American Film Institute. Name the movie that includes the following dialogue. Correct! Lacey Chabert speaks these words in the screenplay by Tina Fey. Incorrect. The correct answer is MEAN GIRLS. Lacey Chabert speaks these words in the screenplay by Tina Fey. Drag the headshot below into the correct film poster from one of the artist's movies and the name of the artist will appear below. Art Garfunkel made the leap from singer to movie actor in CARNAL KNOWLEDGE (1971), directed by Mike Nichols. IT'S ANNETTE BENING'S BIRTHDAY. LET'S CELEBRATE WITH A QUIZ! What did Bening’s character do to impress the Guest of Honor at a White House state dinner in THE AMERICAN PRESIDENT (1995)? 1. She recited the names of all the presidents. 2. She sat in with the Marine Corp band. 4. She opened a bottle of Champagne. Correct! Bening's character rescued a dull party with her ability to converse with the French President and his wife. Incorrect. The correct answer is #3, She spoke French. Bening's character rescued a dull party with her ability to converse with the French President and his wife. Correct! The line is spoken by Robert Armstrong as Carl Denham at the end of the original KING KONG (1933), screenplay by James Creelman and Ruth Rose. Incorrect. The correct answer is KING KONG. The line is spoken by Robert Armstrong as Carl Denham at the end of the original KING KONG (1933), screenplay by James Creelman and Ruth Rose. Jackie Cooper, a child star of the 1930s, played Daily Planet editor Perry White in SUPERMAN (1978). Correct! Peter Sellers says it as US President Merkin Muffley in the screenplay by Stanley Kubrick & Terry Southern & Peter George. Incorrect. The correct answer is DR. STRANGELOVE. Peter Sellers says it as US President Merkin Muffley in the screenplay by Stanley Kubrick & Terry Southern & Peter George. Myrna Loy played Nora Charles opposite William Powell in THE THIN MAN, one of the four films listed – all released in 1934. "The moment I meet an attractive woman, I have to start pretending I have no desire to make love to her." Correct! Cary Grant says it to Eva Marie Saint in the screenplay by Ernest Lehman. Incorrect. The correct answer is NORTH BY NORTHWEST. Cary Grant says it to Eva Marie Saint in the screenplay by Ernest Lehman. Thanks to everyone who entered our Mel Brooks Member Sweepstakes last month and congratulations to our 10 lucky winners! Your copy of the Shout! Factory's box set of five DVDs and one CD, "The Incredible Mel Brooks: An Irresistible Collection of Unhinged Comedy," is on its way. 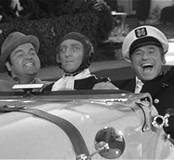 Winners answered correctly that 1) Sid Caesar gave Mel Brooks his start; 2) Carl Reiner first interviewed The 2000 Year Old Man; and 3) "Springtime for Hitler" was the title of the show produced by Max Bialystock and Leo Bloom in THE PRODUCERS. Among those who answered correctly, the following AFI members were chosen at random to receive the prize: Daniel Benjamin, Mark Browning, Donna McNeely Burke, Allen Eckhouse, Stephan Fortes, Thomas Holliday, Joyce Lynn Jones, Mitra Mohammadi, Bill Mosier and Duggan Wendeborn. We hope you enjoy and share the laughter that our 41st Life Achievement Award honoree brings into your home! "When a man's partner is killed, he's supposed to do something about it." Correct! Humphrey Bogart says it in the 1941 film noir classic with a script by director John Huston. Incorrect. The correct answer is THE MALTESE FALCON. Humphrey Bogart says it in the 1941 film noir classic with a script by director John Huston. 5.20.13: IT’S CHER’S BIRTHDAY. LET’S CELEBRATE WITH A QUIZ! In which movie did Cher say, "Don't do anything I wouldn't do! Or don't do anything I would!"? Correct! She says it as Mrs. Flax to her daughter Charlotte played by Winona Ryder in Richard Benjamin's 1990 film. Incorrect. The correct answer is MERMAIDS. She says it as Mrs. Flax to her daughter Charlotte played by Winona Ryder in Richard Benjamin's 1990 film. "One: Down to the road block, we've just begun. Two: The guards are through…"
Correct! The title squad chants these and 14 more numbered rhymes to memorize their mission assignments in the screenplay by Nunnally Johnson and Lukas Heller. Incorrect. The correct answer is THE DIRTY DOZEN. The title squad chants these and 14 more numbered rhymes to memorize their mission assignments in the screenplay by Nunnally Johnson and Lukas Heller. Louise Lasser plays "Nancy," Woody Allen's activist girlfriend, in BANANAS (1971). "Here y'are, baby. Take this, wipe the lipstick off, slide over here next to me, and let's get started." Correct! Jerry Lewis speaks these words as "Buddy Love" in the script by Lewis and Bill Richmond. Incorrect. The correct answer is THE NUTTY PROFESSOR. Jerry Lewis speaks these words as "Buddy Love" in the script by Lewis and Bill Richmond. 5.16.13: IT’S PIERCE BROSNAN’S BIRTHDAY. LET’S CELEBRATE WITH A QUIZ! In THE TAILOR OF PANAMA (2001), Brosnan played Andrew Osnard. What was Osnard's profession? Correct! The movie was based on the novel by John le Carré, who also wrote TINKER TAILOR SOLDIER SPY. Geoffrey Rush played Harry Pendel, the title tailor. Incorrect. The correct answer is #4. The movie was based on the novel by John le Carré, who also wrote TINKER TAILOR SOLDIER SPY. Geoffrey Rush played Harry Pendel, the title tailor. Anjelica Huston is the daughter of director John Huston and granddaughter of actor Walter Huston. 5.14.13: IT'S GEORGE LUCAS' BIRTHDAY. LET'S CELEBRATE WITH A QUIZ! In which category does George Lucas have the most combined film and television credits? Correct! According to imdb.com, Lucas has credits on 88 projects as Writer, 66 as Producer, 19 as Director and 18 as Editor. Incorrect. The correct answer is #3. According to imdb.com, Lucas has credits on 88 projects as Writer, 66 as Producer, 19 as Director and 18 as Editor. 5.13.13: IT’S HARVEY KEITEL’S BIRTHDAY. LET’S CELEBRATE WITH A QUIZ! Which unlucky director has not yet made a movie with Harvey Keitel? Incorrect. The correct answer is #3. What color is Shirley MacLaine's bra and stockings in IRMA LA DOUCE? Correct! Spoken by Robin Williams, the quote from the screenplay by Tom Schulman is #95 in AFI's 100 YEARS...100 MOVIE QUOTES. Incorrect. The correct answer is DEAD POETS SOCIETY. Spoken by Robin Williams, the quote from the screenplay by Tom Schulman is #95 in AFI's 100 YEARS...100 MOVIE QUOTES. Natalie Wood starred opposite James Dean as Judy in REBEL WITHOUT A CAUSE (1955). Correct! Jake Gyllenhaal says it to Heath Ledger in the 2005 western written by Larry McMurtry & Diana Ossana, based on the story by Annie Proulx. Incorrect. The correct answer is BROKEBACK MOUNTAIN. Jake Gyllenhaal says it to Heath Ledger in the 2005 western written by Larry McMurtry & Diana Ossana, based on the story by Annie Proulx. 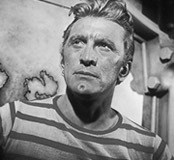 What color are the stripes in Kirk Douglas' shirt in 20,000 LEAGUES UNDER THE SEA (1954)? Maggie Gyllenhaal was nominated for the Academy Award for Best Actress in a Supporting Role for her performance in CRAZY HEART (2009). AFI's Directing Workshop for Women (DWW) will screen eight short films for invited members of the film community and AFI Patron Circle Members at 6:30 p.m. tonight at the Director's Guild in Los Angeles. The films were developed in an immersive year long fellowship tailored to women who have had at least seven years' experience within the film industry and are transitioning into the role of director. This year's participants are: Shaz Bennett, Catherine Dent, Antoneta Kastrati, Lauren Ludwig, Stephanie Martin, Juliana Peñaranda-Loftus, Lisanne Sartor and Sarah Gertrude Shapiro. A keynote address will be delivered by Ava DuVernay, winner of the Best Director Award at the 2012 Sundance Film Festival for her second feature film MIDDLE OF NOWHERE. DuVernay, a former publicist, is currently in post-production on her documentary about Venus Williams for ESPN Films and has just completed a promotional film for Prada. Actors featured in DWW films who are expected to attend include: Shohreh Aghdashloo, Anna Camp, Frances Conroy, Ashley Williams and Rumer Willis. 5.6.13: IT’S GEORGE CLOONEY’S BIRTHDAY. LET’S CELEBRATE WITH A QUIZ! WHERE WAS GEORGE CLOONEY BORN? Incorrect. The correct answer is #1. "It took me sixteen years to get here. You play me, and I'll give ya the best I got." Correct! Roy Hobbs (Robert Redford) makes that promise to his manager in the 1984 film written by Roger Towne and Phil Dusenberry based on the novel by Bernard Malamud. Incorrect. The correct answer is THE NATURAL. Roy Hobbs (Robert Redford) makes that promise to his manager in the 1984 film written by Roger Towne and Phil Dusenberry based on the novel by Bernard Malamud. Dennis Quaid plays Doc Holliday in WYATT EARP (1994), Lawrence Kasdan’s western co-starring Kevin Costner and Gene Hackman. "The enemy's an age – a nuclear age." Correct! Frederic March as President Jordan Lymon makes the observation in Rod Serling’s screenplay for this 1964 Cold War classic. Incorrect. The correct answer is SEVEN DAYS IN MAY. Frederic March as President Jordan Lymon makes the observation in Rod Serling’s screenplay for this 1964 Cold War classic. It’s Dwayne Johnson’s birthday. Let’s celebrate with a quiz! What was the name of Johnson’s character in THE SCORPION KING (2002)? David Strathairn plays Pierce Morehouse Patchett who runs a prostitution ring in L.A. CONFIDENTIAL (1997). 'Tis the season of Mel Brooks. On May 20, your local PBS affiliate will air MEL BROOKS: MAKE A NOISE as part of its American Masters series. Then on May 21, the DVD of that broadcast will be released. AFI's 41st Life Achievement Award Tribute, which takes place June 6, will be broadcast on TNT cable later in the month, followed by encore viewings on its sister network Turner Classic Movies (TCM). What television comedian gave Mel Brooks his start? Who first interviewed the 2000 Year Old Man? What's the name of the play produced by Bialystock and Bloom in THE PRODUCERS? Send your answers along with your name, address, phone number and e-mail address to membership@AFI.com with "Mel Brooks Contest" written in the subject line. The names of those who answer all three questions correctly will be entered into a random drawing and the first 10 will receive the prize. Complete giveaway rules and conditions are available here. Good luck! The Sony Digital Arts Center is perched high atop the American Film Institute's Hollywood Campus, behind the Louis B. Mayer Library. The one-story building is a rabbit warren of editing labs and digital storage facilities. Terra Abroms, its new Manager and Post Production Supervisor for the thesis films made by AFI Conservatory Fellows, gave us a tour of the high tech hub and answered our 10 questions at the picnic table outside, a picturesque setting with a view of downtown Los Angeles. 1. Where are you from? I'm from Los Angeles – from Westwood to the Hollywood Hills, and now Toluca Lake. 2. Where did you go to school? My schooling was a little unconventional, even though I went to UCLA. It was more of the "School of Life." I had opportunities to work with some very interesting filmmakers and so I took those opportunities. I worked with Francis Ford Coppola up in Napa Valley and also with Sean Daniel who was the President of Universal Pictures. Sean went on to start a production company with Jim Jacks (who worked early on with the Coen Brothers), where I helped set up their company including their story department. I've been so fortunate to learn from John Singleton, Stephanie Allain, Craig Brewer, Paul Hall, Richard Linklater, Adam Shankman, Kevin Smith, Michael Tadross, Richard Wright. Post production greats such as Greig McRitchie, Michael Harker, Jimmy Honore, John Naveira, Russ Paris. 3. What did you do before you came to AFI? I was a post-production supervisor – primarily on independent features and most recently on reality television (such as the re-launch of PUNK'D). A lot of people pooh-pooh that, but reality television is a good credit to have because you just can't depend on working 52 weeks a year in the current global climate and competing with rebates. Reality TV offers a lot of filler work. Some of the films that I worked on were: DAZED AND CONFUSED; Kevin Smith's first studio film, MALLRATS; John McTiernan's BASIC; Craig Brewer's HUSTLE & FLOW and BLACK SNAKE MOAN; and a lot of independent films that probably most people haven't seen. 4. How long have you been at AFI? Five months, since October 22. 5. What do you do at AFI? AFI has a talented faculty and staff. As the post supervisor for thesis films, I work under the Vice Dean of Production and Post Production, Phil Linson. I consult and advise the Fellows on sound, music, color correction and visual effects. I also manage the Sony Digital Arts Center including 19 editing rooms, the ProTools rooms and our color-correction suite. My goal is to make sure the filmmaker fellows have the post production tools or resources needed to complete their movies and support the amazing faculty and staff however I can, if needed. I'm also working with the Library and AFI Productions on archiving and digital asset management. 6. How does that affect our members? I think the connection would be through the films the Fellows are able to complete. 7. What was your best day at AFI? This is a very hectic culture I've been dropped into. I get to work with professionals who have had a great deal of success. It's a great day and a real pleasure when I get to know them. The Fellows are inspiring to me. It's great to come to work and see how they approach the inherit challenges of the craft which results in extraordinary films because of the synergy that happens here. 8. What are you working on today? Today I will be working with Fellows on their thesis projects to help with visual effects, finding composers and replacement songs. Providing resources for Fellows to research practical blood vs. digital blood or how to extend a compound because they're only going to build a few buildings and they want to extend it on the screen. Checking in with a team to make sure they are on schedule. Building a community of vendors to support AFI Fellows and alumni by offering their services at reduced prices. Organizing the status of the 20+ projects on paper. Reviewing how to better utilize our space and technology, the day-to-day costs and needs as well as projecting what costs and technology we'll need to keep current. 9. What don't your colleagues know about you? My father-in-law edited SUGARLAND EXPRESS, was nominated for an Academy Award® for BLUE THUNDER as well as winning two Emmys®. He also was a television director. 10. What's your favorite film? How can anyone have a favorite movie? There are so many good films. Once I started working at AFI, I started watching the film lists that fellows need to watch. ALL THAT JAZZ, HAROLD & MAUDE, TOOTSIE, to name a few. I love good stories (TENDER MERCIES, THE IMPOSSIBLES); small films with big hearts and stories that grab my imagination or stir something inside me. Jarmusch's STRANGER IN PARADISE. Godard's BREATHLESS. Herzog's FITZCARRALDO. Lee's SHE'S GOTTA HAVE IT. Egoyan's CALENDAR. David Russell's THREE KINGS. Or pure entertainment (like "SKYFALL" OR "DJANGO UNCHAINED").